My boyfriend bought a 1948 Dodge pickup truck about 5 years ago from a family friend. The exact details of how this truck came into the friends possession is unknown, but I have heard that he got it from a gentleman who passed away (his age and date of death are unknown). My boyfriend has had many bizarre experiences ever since he purchased this truck. He has heard the radio playing when the key is not in the ignition, the doors opening and closing when no one is in, or even around the truck! One time, his uncle walked up to the truck thinking his brother (my boyfriend's Dad) was sitting inside of it and was actually talking to someone! It turns out my bf’s dad was inside the house the whole time. We were sitting around talking about all these strange occurrences so we decided to go outside and take pictures of the truck. The porch light was turned off, and since it was nighttime, the only light we were working with was the flash of my camera. At first, the pictures were coming out very dark, and all we could see upon reviewing them was the reflection of the headlights of the truck. We decided to get a little closer. This time, I stuck my arm out as far as it would go and snapped the picture. As the flash went off, I looked inside the truck and saw someone sitting inside!!! I got so scared, I ran back inside the house. After determining it wasn’t any of his family members, we decided to upload the picture onto his computer, since you couldn’t see any details upon reviewing that particular picture on my camera. We uploaded the pic onto Kodak Easyshare software and sure enough, you could see someone sitting there, on the passenger side! You can make out a dark shadow on the passenger side which resembles a human body. Unfortunately, because the picture was so dark, we couldn’t make out any other details. I edited the picture with the “enhancement" option, which only brightened up the picture a bit. I still have the original picture unedited if you would like to compare the two. I am sending this picture now to you, in hopes that you might be able to clear up the fuzziness and be able to reveal more details and tell me what you see. I see the "person" on the right clear as day. That one scares me more than the one inside the truck. I see at least three "ghosts" in this photo... VERY AWESOME PIC. It looks like an Indian. You can clearly see the top picture is showing the left headlight more and the bottom is showing most of the hood so it looks like she took the first with someone sitting in it (maybe a family member) then took the bottom picture without the flash. THE TOP ONE SHOWING HOOD MORE, BOTTOM SHOWING HALF THE LEFT HEADLIGHT MY MISTAKE. I seen that and I screamed....That's too scary! This really was one of the outstanding and scariest photo I've seen. Well, I am in our office today, and I was just browsing ghost photos and videos when I came and visited this site. And this one really freaked me out! I must say, I was scared to death! The hairs all over my body stood out and also got freaked! I read almost all the comments posted here, and some who commented here said that they took the original photo and did the enhancing themselves. So, what I did is, I also saved the photo and used www.picnik.com (a photo-editing site) that really gave a clear evidence, or I must say "proof" that there were really some spooky images inside and outside that scary truck. Well, as I've come to enhance the photo, and zoomed it, I really could not find the "child" many were saying, but all I found out were these: a nun on the left side (passenger's seat) of the truck, and the other one was OUTSIDE the truck, specifically like opening the door (right side) of the driver's side of the truck. I suggest you do the same just as I did, to see for yourself, that this isn't a HOAX. Okay? Well it is hard to make a determination weather a pic is fake or not by just seeing it in this type of forum. Can it be fake? Sure any investigator would tell you that along with any sensible person. Can it be paranormal? Absolutely. Is it? Don't know for sure when you do paranormal investigating and are confronted with evidence then you must be skeptical if its not evidence you have captured in a controlled environment. When presented with a pic such as this. You have to ask a lot of questions and consider a lot of things such as who took it who was there how was the weather conditions, etc. So it is an interesting pic. But to look at it and say for sure weather it's for real or just someone caught sitting in the truck. well that's hard to say. Don't know why people rip the backside outa people who experience things like this, they should be lucky we share our findings. Are they jealous because haven't been so lucky to record these moments in time or.....? Ghosts don't have to be transparent because in my experience my ghost was quite solid.....perhaps it's to do with the energy they can muster? I found out you're mystery, conveniently that truck used to be owned my the Carlson's back in the 1800's now Jim Carlson was a doctor in Mass but by 1895 he, his wife, and his 32 year old son took a ride to the market in the middle of the night, truck shut down, ending up in a lake drowning his wife and kid. He did restore the truck when it was fished out, but 3 days before his death he had it up for sale and he took some photos with the same figure. He notified the authorities it was his son so they told him not to touch the truck or he would anger it, knowing his son loved his truck. He said from the day his father bought it, he will never leave it alone to rust. im not really sure whether or not this is fake. it does look pretty obvious that a living person is sitting in the car....but i have also taken some shots with my phone that scared me, my family, and my friends. im only 13 but i know what i am talkin about. i took a pic that showed a black man pointing towards my mother. yes, the pic was bright enough i could tell he was black. another weird thing was the same black ghost was seen laying in my sisters bed when my mom took a shot of her sitting on it on her birthday. after a few more encounters (one was violent) we moved 2 states over!!! i know your pain but im still not sure. Okay, anyone who calls this fake obviously just goes on these sites to rip on them when they have no idea what really is there or is showing. Those people have no respect, and to them I say, gtfo. I lol'd at people saying it's fake. I really lol'd at those of you who commented saying this is fake. Especially at THIS IS SO FAKE. The only reasoning you have for this picture being fake is the placement between the two? Wow. If you actually read the comments, Lizette clearly explains that it was the cropping that made it look different. You have to crop the photos so they will be posted on here if they are larger than allowed. Anyways, Lizette, I do believe you truly have something here, and I am intrigued by what the paranormal team found with Jennie. I was hoping you had the DVD they showed you, or at least a copy of it so all of us could truly see and hear their findings. Was there someone standing in the doorway when you took this picture? Is the truck in a garage that is connected to the house? To me it looks like someone with a white t shirt is standing in the doorway and he is very 1950's looking to me if that makes ant sense. He is on the right hand side of the picture. IDK..... Maybe I am seeing things. Even I accept with one of the friend comparing your original ohoto and the photo you said to be brightened. The car lights are seen in the original you have taken but its not the case in the one you have brightened. I see the Nun/Chubby man in the seat, and i also see the kid in the driver's side, it looks to me like he's trying to climb out the window. Perhaps its an imprint of some mundane happening back in the 40's/ 50's? I do believe in ghosts. Definitely something bad has happened in the car, & the thing wants to tell you something. Believe it or not ghosts do exist. What's that big right thing on the right? It isn't rocket science, just look and compare the two. If it is real it looks like a native American Indian. Although the placement of the picture is a bit off, if you look at the dark picture, you can still see somewhat of a figure similar to the one above it. It may be the light in the room I am in, but to me, the picture on the bottom is very convincing. 1.In the original picture the headlight of the car are shown while the "enhanced" picture's headlights are not shown. 2.In the original picture the window is not completely shown while in the enhanced picture it is. I belong to a group that investigates Haunted Vehicles. 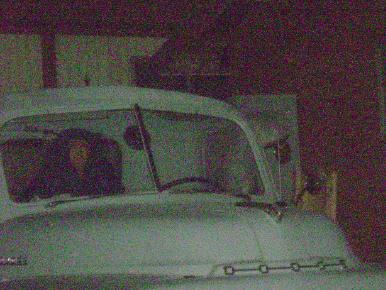 www.hauntedvehicles.com www.bandedspirits.com. Anyway, we have investigated guite a few cars ..hearses..boats etc. and YES they too can be haunted. The best thing you can do is to invested in a digital voice recorder that can be up loaded to your pc. You can find them for 40 bucks! Sit in the car and start asking questions. Like, who are you. WHat is your name. How old are you. Was this your car. Why did you die. and Do you need help. etc. Be sure to wear a good set of head phones when you review the recording. Good luck and remember it is the living you have to be afraid of! sorry this is fake. this is someone in the car. This is unbelievable! that is amazing. i have never been lucky enough to capture anything paranormal on camera. Nice job with the pic!!! If this is not a hoax it is pretty damn spooky. It looks like a person (for lack of better description) wearing a "nun" headdress, and looking right at the camera. the post below regarding the different angle. Read my post back on 27Dec. The reason the two pics look different is because I had to crop both my submissions to be sure they uploaded onto this site. The original, unedited picture was way darker than the picture I enhanced, therefore when I went to crop the original, unedited picture to be able to submit it to this site, it was too dark for me to see it to match the picture I enhanced. First of all, I want to say the picture is very intriguing. But I do have a question. Out of curiosity I grabbed the original darker picture and lightened it myself and noticed the angle of the picture is different. The top photo that has been lightened seems to be a head on shot and shows more of the "figure" in the passenger's seat while the darker picture shows less of the figure in the passenger's seat. Why is that?? Thank you everyone for your comments. Almost a year has gone by since I posted the pic and I'm amazed that I'm still receiving comments. For those of you who haven't or don't read through ALL the comments please do so. I posted a lengthy post back in June or July with the results of the investigation that PITT did on Jennie (the truck). I still haven't come to the conclusion if what I caught a pic of was something paranormal or just simply a homeless person like some of you have suggested. I'm leaning more towards something paranormal because I don't understand why the face isn't clear (if it was in fact a human person). Why can't I clearly make out the eyes, nose or mouth? Bostghuster: I assure you with all sincerity that it is NOT a jacket hanging over the seat. Look closely at the drivers side. The drivers side doesn't have a seat tall enough to hang anything over it. Well, the passenger seat is exactly the same. Do some research on a 1948 Dodge pickup. You'll see that the backs of the seats in those things went straight across, and were connected. One long seat, not like the trucks of today were the driver and passenger have their own individual seats. Sorry to ruin everybody's excitement with this picture but it's blatantly a jacket that's been hung over the back of the seat. The "face" is just the head rest of the seat that the jacket has been hung on. Did you consider the fact that someone could have just been sleeping in the truck, like a homeless person? I see a man sitting in the passenger seat and the baby face laughing or crying with something on top of the baby's head outside of the truck above by the driver's side. I also see a strange big cat at the front of the truck. That cat have big eyes and there is a man mouth below the cat's eyes. Strange and crazy pic. There are alot of spirits in that truck. Just some clarification on TruthSeekers advise. By pointing the Bible in the direction of the ghost, you are proclaiming that you have power in Christ, and the ghost can't even touch you. I have done hundreds of investigations and this has never failed to protect me when I needed it. I had to do it for myself. and i do see the white figure entering the drivers side too. I looked at both pics, and used my browser to zoom in on the truck, and you can plainly see something or someone there. Truly freeky! yes its so freaky picture. It looks to me to be a coat or jacket hanging in the back. The "face" in the hair is just the jacket lining, or possibly the dim reflection of a face in the windshield. Digital photosites do really strange things at ultra low signal levels (i.e. very low light) and the auto-gain circuits generate "artifacts" which can easily be mis-identified by our pattern searching brain. Think about the "face" of Mars. It was just a trick of the light as a second photo from a slightly different angle showed what was really there. But can anyone see a white siluette entering the other side of the car?! O.M.G.! THAT IS SO FREAKY! I read all the post. At first I don't saw the little one, but if see carefully in the drivers seat there is like 1 year or 2 year baby, the cloth is white and you can see the arm. I honestly think the photo is real. You have to be in the scene and live the experience. In Puerto Rico we have a saying that say, Anyone knows what is in the pot, only the spoon that stir it. Hello, everyone! After an EXCRUCIATING 5month-and VERY WELL WORTH-wait, TXRATTLER and I got together over the weekend for the final reveal of the "Jennie" investigation. PITT (Paranormal Investigative Team of Texas) was kind enough to put together a 10minute DVD of their findings. Let me tell you, this video gave me the CHILLS! Unfortunately, they didnt catch too much photographic evidence. 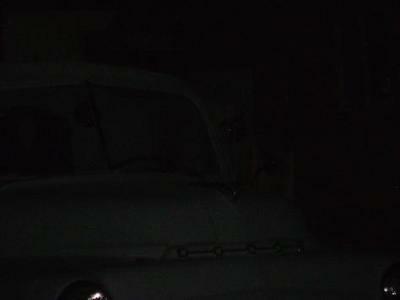 Although in almost every picture they took of the truck, there was an orb in every shot. What they did capture was several pictures with unexplained green lights seeming to appear out of nowhere. Even though there really wasnt any photographic evidence to suggest that Jennie was haunted, the EVPs that PITT captured definitely suggested otherwise. They captured 4 VERY CLEAR EVPs, and listening to them made my skin CRAWL!! The first EVP was captured by one of the founders of PITT. He was sitting in Jennie, asking questions and captured what sounded like somebody trying to turn the truck on. You can hear the engine screeching. The second EVP was of the truck moving back and forth, it sounded like knocking. The third EVP was a female cough and the fourth EVP was somebody saying the name "David." I am posting this information on my behalf, based on what I saw on the DVD the team put together of the evidence they gathered. Being that PITT actually conducted the investigation, and gathered the evidence, TXRATTLER has more information than I do about any paranormal activity going on with Jennie. Therefore I have given TXRATTLER permission to post any additional information regarding the investigation PITT conducted. He can give you all more details about what they found, or correct me if I'm wrong about anything I have posted in regards to the DVD. Great picture! How exciting to capture something such as this. Definite features and could be the prior owner as spirits do tend to attach themselves to objects (and people) they were familiar with in life. I have studied both photos with my Daughter and both of us can still see the figure shape, you just have to look a little harder...however I think that you caught something there, as Spirits will hang about as long as the can...I try not to judge badly on anyones photo and neither should anyone else unless they were there themselves. Read my post back on Dec 27. It will explain why you think the pictures are two different ones. They are not. Please also read Brenda, the webmasters post on that same date. She checked both pics, and agrees that they are the same picture. They are. If you look at the original picture below you can see that the two are completely different. For one, the picture at the top shows the whole truck window where as the picture at the bottom cuts off the truck window on the left. Also, the truck is more right on the top lighter picture than the bottom. I'd have to say this is fake. Sorry. someone actually said carry a bible and point it in the direction you think a ghost is in. haha... nice one. ...for your comments!! I was contacted by the investigators yesterday who told me they are completing the finishing touches on the investigations they conducted, and tying up any loose ends before the final reveal. They didnt give me any more information regarding what evidence they came up with, but they did say that I will be very pleased with the results. With that said, I am VERY EXCITED and very much looking forward to see what paranormal evidence they gathered based on this one (very controversial) picture that was taken. ok, thats pretty good. you sure its real?. Well,this seems diffrent from other pictures ive seen. The "ghost" seems very solid in my opinion. What you could do is cary a small Bible around with you, maybe in your purse of a bag or something, and when ever somthing happens that you think is supernatural, pull out the Bible, pooint it around where you think the source is, and quote 'the Lords Payer.' This has always helped me in the past. I pray you find out what it is and why it is there. And i shall keep you in my prayers. Anonymous makes a good point. He/she is only giving an opinion. I know people really believe something one way or the other, but let's let people speak without jumping at them, okay? Didn't expect this coming at me!!! OK. Didn't mean to step on anyones toes! I said, "I was surprised" how dark the photo was. I did not say it couldn't happen. How far away was this taken? Didn't say. Is there a flash on the vehicle? No. I've taken tons of pics in the dead of night in tons of circumstances and usually ended up with a little more clarity than that! Nothin super special about my camera! Just my opinion on a cool picture. Even the person who said ghosts aren't real earlier didn't get attacked... Hope we don't lock horns anymore. As for the guy that says this can't happen with a Sony Cybershot, you're wrong. I have the same camera and get the same kind of dark pictures. You might have a super special camera that allows you never to have a dark picture at night. hay i just want to say to let me know about the results with that creepy chick and it did creep me out so much tat i dnt wana go over ne more! And that i do beleive you . Hello everyone, thanks guys for all your comments, positive and negative! I wanted to use this oppurtunity to update everyone on the results that the paranormal invetigative team conducted back on Jan 03, 09 (please view update I posted on Jan 05). They contacted me with the results of the investigation just two short weeks after they conducted it. Unfotunately, they did not come up with anything in any of the pictures they took. However, they did hear a voice on the recorder they left in the truck when they did an "unmanned EVP session." The voice on the recorder was a female, and she said the name David. This intrigued the team so much, that they asked to do another investigation, not just on the truck again, but on the entire property as well. they conducted their second investigation on Jan 30, 09. They expressed more odd occurences to include hearing people walking outside and sounds like somebody climbing the house to the roof. At some point during the night, we invited the team to come inside to warm up. One of the co-founders of the group stopped dead in his tracks. There is a portrait of my boyfriends grandpa (who is deceased) hanging in the living and that gentleman wanted to know who he was. Apparently, that gentleman had been having dreams about my bf's grandpa ever since they conducted the first investigation! He also stated that it is his grandpa who is present. PS: T&M: My boyfriend knows better than to mess with me. I see what appears to be an overweight woman with long brown hair, kind of teased. She appears to e smiling in a friendly way, so I wouldn't worry too much about it. But I do think she needs to cros over...unless she was just visiting for the day!